The Grave-Stone of Thomas Rees (Twm Carnabwth) , believed to be the leader a band of farmers and smallholders , dressed in women's clothing , the first of the Rebecca Rioters . 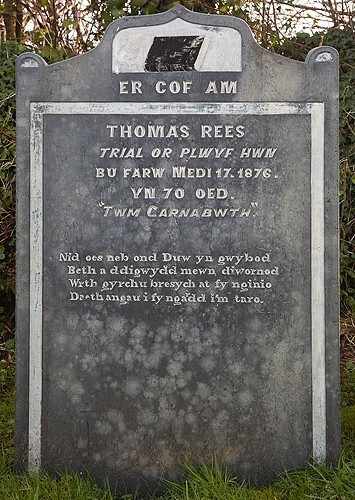 Thomas Rees died aged 70 and his grave-stone stands in his beloved Bethel Chapel at Mynachlog-ddu. "Nid oes neb ond Duw yn gwybod/ Beth a ddigwydd mewn diwrnod. Wrth gyrchu bresych at fy nginio,/ Daeth angau i fy ngardd i'm taro". "No one but God knows what may happen in one day. While fetching a cabbage for my dinner, death came into my garden and struck me"